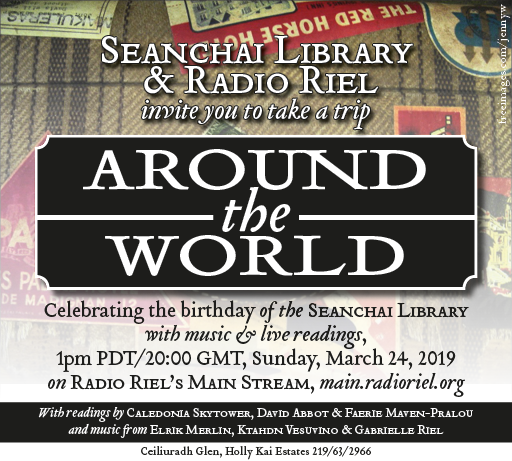 Seanchai Library celebrates its 11th Anniversary with a trip around the world, in partnership with Radio Riel. Join us in Ceiliuradh Glen for an afternoon's journey of imagination and adventure. 12:30pm - Stories in Voice, with Shandon Loring, Seanchai Library Founder Derry McMahon, and Bear Silvershade. 1:00pm - International Folktales on stream, and broadcast on Radio Riel Main Stream, with Da5id Abbot, Faerie Maven-Pralou, and Caledonia Skytower. Join us in The Glen, or tune in as we celebrate 11 years and over 2000 stories, presented live in virtual worlds. WHEN WE SAY "THOUSANDS", WE ARE NOT KIDDING! TEA TIME: Sherlock Holmes' Greatest Hits!